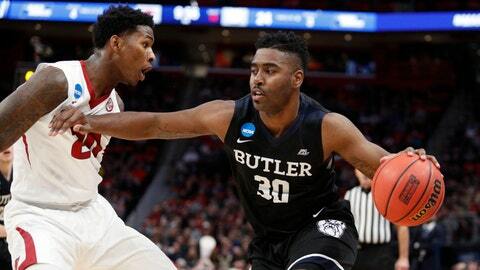 Butler's Kelan Martin surpassed 2,000 career points in the Bulldogs' first-round NCAA Tournament victory over Arkansas. DETROIT — Butler coach LaVall Jordan watched his team race out to a huge early lead, then give it all away before the first half was even over. That could have been a huge emotional swing, but the Bulldogs kept their cool. When the 10th-seeded Bulldogs pulled away again at the start of the second half, they stayed out in front, dispatching seventh-seeded Arkansas 79-62 in the NCAA Tournament’s East Region on Friday. Kelan Martin scored 27 points and Kamar Baldwin added 24 for Butler, which advanced to face second-seeded Purdue on Sunday. The Bulldogs (21-13) raced to a 21-2 lead in the opening minutes, only for Arkansas to answer with a 27-6 tear. Butler took control again early in the second. Jaylen Barford scored 15 points for Arkansas, but the Razorbacks (23-12) struggled in the paint — 6-foot-11 freshman Daniel Gafford managed only two field goals. The Arkansas pregame notes noted that Gafford had 27 more dunks this season than Butler’s whole team, but it was the Bulldogs who threw down the first one of this game when Tyler Wideman slammed in an offensive rebound to make it 7-2. Another Butler dunk — this one by Baldwin — made it 18-2, and after a 3-pointer by Martin, the Razorbacks used their second timeout of the half. Arkansas answered with a quick 10-0 run, and although Gafford was contributing little offensively, the Razorbacks came all the way back and took a 29-27 lead on a 3-pointer by C.J. Jones. That advantage was brief, though. Butler was up 36-31 at halftime. The Bulldogs quickly pushed the lead back to double digits in the second. Martin, who surpassed 2,000 points for his career during the game, made two 3-pointers in a 9-2 run that made it 49-38. Butler has won at least one game in each of the last four NCAA Tournaments, this one in the team’s first season under Jordan. The Bulldogs opened commanding leads over Arkansas in both halves and won on the strength of 11-of-26 shooting from beyond the arc. The Razorbacks came in shooting 40 percent from 3-point range, but they went just 4 of 18 in this game and didn’t have enough success inside to make up for that. Martin and Baldwin scored 32 points in the second half. For the game, those two outscored the Arkansas tandem of Barford and Macon 51-27. Arkansas managed only 22 points in the paint and was outrebounded 45-25. Although the Razorbacks made a nice comeback in the first half, they’d have been in better shape at halftime if they hadn’t allowed 10 offensive rebounds in the first 20 minutes. Gafford finished with seven points, five rebounds and three blocks in 21 minutes. It was the first loss in the tournament for the Southeastern Conference, which had been 5-0. Butler takes on Purdue in an all-Indiana matchup. The Boilermakers beat the Bulldogs 82-67 on Dec. 16, but Purdue won’t have Isaac Haas this weekend after he injured his elbow in Friday’s win over Cal State Fullerton. Arkansas heads into the offseason and will have some changes on the horizon. This team had three senior starters.